Ian Struckhoff et al, The Deathlings: Anne’s Story no. 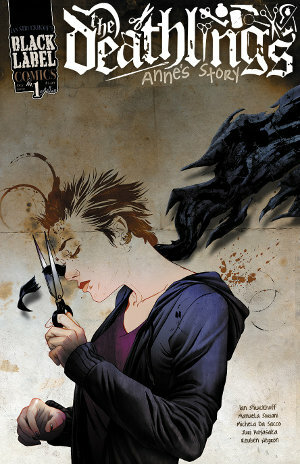 1.Black Label Comics, 2010. Pp. 28. ISBN 1396402418. $5.99. Ian Struckhoff et al, Black Label Comics (anthology) no.1. Black Label Comics, 2010. Pp. 44. ISBN 1396402433. $8.00. I hold up my hand: I am not a big comic buff. I cannot reel off data regarding writers, artists and movers and shakers in the industry (my one fact is that Mark ‘Luke Skywalker’ Hamill is active in the comics trade and has been for some years); but I like reading them, and it is clear to deduce from readerly reaction when a comic works and when it does not. First I did some digging. Just who is Ian Struckhoff? He arrived suddenly into my world view through these comics, and is not a name I recognise. The anthology comic proudly tells us on the inside of the front cover that Black label Comics are “independently published”. Privately published work has long had a reputation for producing somewhat dire writing that should never see the light of day: the suspicion is that if any writer can get it published, it is more a work of ego than of art. Although independent publishing is not the same as private, there does remain a small worry in the back of the mind; is this some fantasy strip by a sub-standard talent flaunting itself because it found a press to publish at all? The worry is compounded by the fact that the whole world of Black Label—comprising, we are told, several different stories, universes, genres and planned comic book series—is sprung from the mind of one man. It does start to look troublingly like a narcissistic trip. 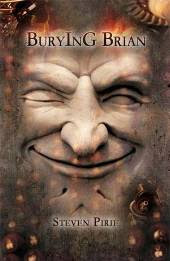 But then there is the sheer scope of the project: from the sample chapters/ snippets in the anthology (cunningly designed to give one a taster of the main series and tempt one into investing in the whole), there are at least six separate, but interrelated series to be developed, stretching from noir to western to bizarre to gothic, and all with the influence of the fantastic (some positively steeped in it). Artistic duties are farmed out, and in fact there is a call for artists to submit samples of work on Struckhoff’s deviantART member page, but the thrust of the vision remains his, suggesting that Black Label has been a real labour of love and effort to enter the world of comic books. He states on his deviantART page that his reason for being online is “to get involved with the community, to show my artwork to the world, to become a better artist.” While not uncanny to the need for networking and contact-making, he is also open to learning and to sharing. This is not publication purely for personal satisfaction, but also sharing a vision with a much wider audience: the motives seem sound for a business venture based on a personal strength. More of Struckhoff can be found on his deviantART page, where a short biography gives his interest as photography, comics and philosophy. Comics are often used as a forum for espousing and examining the interplay of reality and imagination, especially through the reworking of myth and legend. The combination of a graphical eye with a contemplative mindset is not unpromising for thought-provoking story lines. I was pleased with the breadth of engagement he has to his work and with the wider specialist community through the website. The commitment to his work carries on through an enthusiastic and positive write-up (on the webpage devoted to the comics themselves) of his first trip to ‘Comic Con’; perhaps the biggest and most important fantasy/sci-fi event in America each year for anyone involved in creating fantastical fictional world and the fans who love them. Struckhoff’s work appears to mostly comprise the theme of the fantastic—from gothic to fluffy-light. His images, both photographed and drawn, consistently play on ideas of feminine beauty, grace, power and sexuality. It is not surprising to also find strong females at the heart of his stories. To the stories, then, because comics can only stand on how they grab the reader. Time is of the essence for comic books, where the reader needs to be involved, interested and hooked in far fewer pages than a novel, or even a short story. If a picture paints a thousand words, then comic books, profoundly based on the visual, should have this as the strongest selling point; information about where, who, when and what all served up at once in a few succinct frames. So: does it interest? Does it intrigue? Is the artwork pleasurable and does it add to or detract from the experience? These were to be my guide to reviewing (and apologies to anyone savvier about comics who find it too simplistic). The material is sensationalist; no doubt about it. Anne’s Story is a gothic fantasy about a young woman falling into a world of weirdness she does not yet comprehend, watched over by the strangely omniscient Ani, a being from another realm. The anthology features violence, zombies, apocalyptic landscapes and serial killings. This is not half-hearted stuff: Struckhoff and his artists are throwing all they’ve got at it to sell the idea. And underneath it all is this idea of inter-connectedness. In the anthology, Ani’s voice directs the cowboy through his mission among the zombies (‘The Deathlings: Black Label’), she is seen watching the action in a post-apocalyptic somewhere where two children play a dangerous exploring game (‘The Deathlings: Kid Stuff’). Although she does not feature directly in ‘Huginn & Muninn’ or ‘The Dark Age’, the fantastic element is still very strong. The former is about Odin’s two ravens in human form abroad in the world, and the latter, as Ani explains in the amusingly cartooned introduction to the collection, is specifically about a crime-noir world where “all the magic went away, except she [the heroine] meets this guy Nero.” Naturally, given this juicy dangler of a spoiler, the denouement there will be some type of magical incursion. A multi-serial production under one label does strongly suggest a master plan at work by the author, and all the stories, either directly or by implication, build steadily from intentionally mythic roots. And all feature strong female leads. The two ravens are given beautiful female bodies to inhabit while they search out Odin’s curiosity, of the two children it is the little girl who prompts the action, followed by her older male companion and even the male cowboy character is on a mission directed by a female. Strong femininity is the core of this work, and while it might seem empowering, women are also brutally murdered (‘Dark Age’; Anne’s Story), and in a short, sweet little story about a female inventor that almost seems a little throw-away sweetness in the middle of the exotic action and gothic finery, the character’s main hubris is her inability to find love (a typically female emotional quest); realising she cannot make it in her workshop. The most obvious female is Ani, the aforementioned watcher. Depicted as a slim, well-proportioned female of youthful appearance, with pale skin, spiked black hair, dark Goth makeup around eyes and mouth, dressed in raggedy, very brief black clothes and a cloak that wraps around her with a life of its own, she seems the very pin-up of gothic desirability. With a motif of scissors and strange stitched lacerations over face and body, she could almost be a rag-doll of the mind, but unfortunately she stands upon the shoulders of giants, and suffers for comparisons. She will definitely put any comic-reader of any breadth at all in mind of Neil Gaiman’s Sandman epic, with strong overtones of Sally from A Nightmare Before Christmas (but that could be just the stitching...). Specifically, Ani is a conglomeration of Death, Delirium and Dream. Her puckish childishness, oscillating with mysterious gravitas could come from any of Gaiman’s pages, and the idea of the ‘Deathlings’, the overriding story arc behind the comics, seems a paler version of Gaiman’s hugely involving tapestry of fantasy, fable and legend. This isn’t to say that Struckhoff’s idea fails. The fact it can bring up such strong comparisons will conversely provide an ‘in house’ thrill of recognition to those who have read widely. It is also interesting to see how he will take on the challenge of similar-themes-but-new-working. Anne’s Story ends with the image of her broken body on the ground, and a short story in the anthology assures us she is not dead: her best friend is directed, by Ani, to find Anne hidden somewhere in a dream world. Struckhoff is staking his plot out: he wants individualist characters (Anne is teased by her friend for always wearing boyish, punky clothes; the badge of the street-smart ‘individual’), strange situations, and to blur the boundaries. This is different to Gaiman, who re-treated old legends and fairy-stories; imagining the reality of supernatural life by humanising its component parts. Here’s to hoping I have not read this wrong and Struckhoff can prove himself a man of his own ideas. Anne’s Story introduces us to the Deathlings through Ani: she appears in a young woman’s dreams, warning her of dangers to come, but remaining vague on details, only promising darkness and danger. Her warnings seem apt when Anne, trying to find a barbeque in the woods to which her crush has invited her, gets lost and finds a very different gathering. One that turns distinctly sinister when she consumes a special drink and starts seeing the people around her for the creatures they really are... my biggest criticism of the story (aside from the Ani character—see above) was the art work. Yes, it’s strong, yes it’s detailed and yes, the style suits the story: rich colours and clean lines fading into shadows and less definition when Anne finds the supernatural camp-out. But Anne herself is meant to be eighteen. She looked about mid to late twenties. I had a hard time thinking of her mother as her mother; they looked more like sisters. Long-legged, toned and generously-chested, Anne fits the format for most comic book females: idealised to the point of unidentifiable, ridiculous, even. I would believe Anne’s dark-haired, punk-gothic fragility more if she actually looked her age. Feminine beauty is a definite preoccupation with Struckhoff, and such styles of drawing are par for the course in comic books, but I felt a little disappointed there was not more variety from a series purporting towards something magical and special. So was I intrigued? Would I buy into such stories from this first issue? Yes and no. I have already voiced my concerns over Anne’s Story, but I am a bit of a sucker for the epic-mythic. It’s obvious that, with his multi-pronged project, this is what Struckhoff is aiming for, and so, yes, I would be interested to see more. I might even be wiling to give Anne’s Story another chance, to find out more about the Deathlings, whoever they may be. In terms of catching interest, the anthology is the best hook. Collecting up the ideas of one’s projects and releasing it so soon into the label’s run (these two were the first releases; released together last year) is a smart move. It is like a trailer at the cinema; it does make you curious, and that does make you want to know more. Added to this, repeating themes: zombie-invested wastelands in more than one tale, the mirroring of Ani and Anne’s physical appearances, possible crime connections between stories; all these draw the stories closer together, giving one a sense of being a part of a bigger picture. The desire to belong, to see it all, is tempting. The use of different artists and their styles for each story (a staple of comic book formatting) helps to provide texture to the selection, and the artist is well chosen to the tale. ‘Dark Age’s noir thriller is all hard lines, angular view and grey-greens and black. ‘Black Label’s cowboy is saturated in hard lines and bright, stark reds and yellows under a hot, dusty sun. ‘Kid Stuff’ is all cheerful pastel hues and soft, forgiving lines; even the zombies are slightly fade in detail so they don’t look so bad, unlike those the cowboy faces, which are all leaking fluids and raw, exposed flesh and bone. I liked the format. 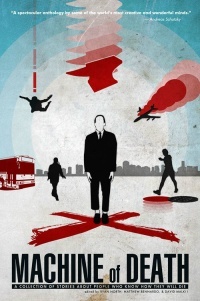 I liked the genre and how it was dealt with. I even like the idea of one stable, many horses under one manager. It won’t be to everyone’s taste, but that is a genre-specific consideration. Lovers of fantasy should give it a try as a refreshing new voice on the scene. I found two stories, perhaps three, within the Black Label Comics Anthology that particularly snagged my interest, and I would pick and choose the stories to follow, but Struckhoff has made a promising first impression with his vision. 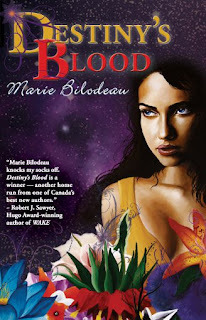 Marie Bilodeau, Destiny’s Blood. Dragon Moon Press, 2010. Pp. 308. ISBN 978-1-897492-11-6. $19.95. I was intrigued by the Dragon Moon Press blurb for Marie Bilodeau’s Destiny’s Blood: “To save the withering First Star, will Layela sacrifice her sister... or herself?” Being interested in both female familial relationships and the concept of ‘fate’ in fiction, I had a feeling I would enjoy this book. Happily the novel matched my expectations. At first I was disappointed by the cover art; although beautifully executed, the picture concerned me—I thought it looked like a romance novel. But I am delighted to report that there are no Harlequin novel clichés to be found within its pages! This book is a highly enjoyable read—it’s compelling and well-written tale of Layela Delamores and her twin Yoma. Layela tries to outrun her difficult past and her nebulous sense of foreboding by moving to the remote planet of Collar to set up a flower shop with Yoma. But when her sister disappears, Layela is determined to find her. Accompanied by Yoma’s friend Josmere, a member of the Berganda ether race, she embarks on an expansive quest to find her sister. In the process she finds both her family’s legacy and her destiny. The twins’ characters are polar opposites—Layela is sensible and forward-planning, while Yoma enjoys the hand-to-mouth existence of living on the run. Layela tries to build a steady life for herself and her sister but Yoma is not on board. It is a situation familiar to most families: Layela wants to impose what ‘she thinks is best’ on her sister but ultimately fails. I liked the way Bilodeau makes the relationship between the two sisters so easy to relate to; she doesn’t descend into sentimental clichés like some sci-fi writers do. This realist approach to the dynamic between the characters brings the fictional world they inhabit closer to the reader. One of the twins is fated to save the First Star, but to do so one must die. The sisters embark on a ‘hero’s journey’ to realise the prophecy that is to be their legacy. This plot is well-realised and interesting, and has a different take on the usual quest scenario typical of this genre. The ending is beautifully resolved with a fitting climax. This novel is feminist in that the female characters are strong and are fighting to shift the androcentric imbalance of power in their world. The concept of the ‘ether’ races struck me as the embodiment of Gaia, the divine feminine. Intuition, vision, nurturing and living in harmony with nature are characteristics of a race that are dying out, due to the ruling military regime. The ether realm is a proliferation of life force, while the military’s world is one of war and death. The botanical descriptions in Destiny’s Blood are beautiful: Bilodeau creates entire genera of flora and fauna to create an immersive setting. The fine writing makes the fate of the Bergandas—a race of plant people—even more poignant as they are becoming extinct. Forced to wear gloves to limit their powers and forbidden from owning businesses on certain planets in the galaxy, the Berganda are being ethnically cleansed. It is the destiny of the Delamores sisters to try to prevent this from happening. One criticism I had of this book—and this is certainly not specific to Destiny’s Blood, as it is almost a science fiction convention by now—is the linking of personality traits to races. For example: “For a Berganda, I’m actually quite positive” (33); “Mirialers were stubborn and loyal to their own” (147). I find this convention pigeonholes the races and makes them seem even more different. In an unequal world, this stereotyping separates the races even further. Bilodeau’s writing is so good that I feel she doesn’t need to rely on this outmoded trope to describe her characters. Nonetheless, this story is well-crafted and often cinematic, at times reminding me of Firefly/Serenity or Star Wars: A New Hope. The story’s pace is fast, with many plot turns. This wouldn’t be the type of story I normally chose to read, as I prefer slower, Ursula K. Le Guin-type meditative narratives, however Bilodeau writes these numerous action scenes so well that I was more than happy to go along for the ride. Aaron Polson, Loathsome, Dark and Deep. Belfire Press, 2010. Pp. 204. ISBN 9781926912141. 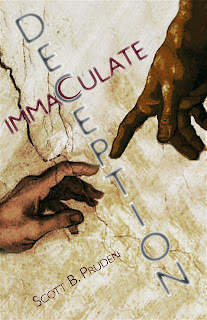 $11.99 print / $3.99 e-book. Henry Barlow fought in the Civil War. His wife met her end as the victim of a vicious murder. He hasn’t touched a pistol or a rifle since and has crawled deep into a bottle of bourbon and when we meet him is hiding out at the only brothel in Ecola, Oregon. There, he receives orders from his employer, H & P Lumber, who want him to travel up the Lewis River and investigate why their camp there has gone suddenly silent. With his colleague, the nervous and meek Otto Olson, and a small group of hired men, Henry makes his way up the river toward the silent lumber camp only to find a situation worse than anyone could have imagined. 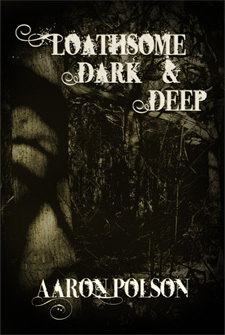 Loathsome, Dark and Deep is Aaron Polson’s third book and second novel and his first published through Belfire Press, a small house established in 2009 and primarily interested in cross-genre titles. The cover evokes a feeling of being lost in the forest, the trees closing in, a feeling I am personally all too familiar with. Even readers who have not wandered aimlessly through an endless labyrinth of trees for hours on end searching for a way back to civilization may find it to be effective in conveying a sense of isolation at the very least. The title of this novel is a subverted reference to Robert Frost’s poem ‘Stopping By the Woods on a Snowy Evening’; where Frost speaks of the woods as “lovely, dark and deep”, here we are given an alliterative opposite. Polson weaves a solid narrative using aspects of Joseph Conrad’s Heart of Darkness, the basis for the film Apocalypse Now, giving it a dark horror, somewhat steampunk and certainly more American spin. Lumber was far more important in America post-civil war than ivory would ever be. Barlow finds Curt’s camp devastated by greed and ambition, men twisted by Curt’s vision and the work of Curt’s second in command, Dr. Scheller, an engineer and inventor. This is a relatively easy read that is hampered only, in my opinion, by too much focus on Barlow’s reminisces and not enough on the situation at hand. Edmund Curt himself appears only briefly and Dr. Scheller almost not at all, and one feels there were opportunities missed for some far more grandiose villain scenes than are presented. Our visitation with The Colonel, a man so driven by religious fervor as to be dangerous, is also all too brief. Chalk it up to the first person narrative, but I felt the scope of the story could have been larger, focusing as it does almost solely upon Barlow. That said, however, Polson’s writing itself is quite good, his descriptions vivid. When Barlow meets his colleague, Olson, he states, “Otto Olson had a face that looked like a thin strip had been sliced out of the middle and the remaining halves shoved back together.” A fantastic image deftly composed and indicative of the rest of the story’s style. Man’s inhumanity to man is not new territory for a writer to cover, but Polson does the job well enough. Barlow’s struggle to maintain a semblance of sanity when everything around him is going to hell and Otto Olson’s eventual growth from lily-livered craven to a man with a bit of sand in him are juxtaposed against characters who have fallen so far down the well they can no longer see the daylight. The frontier was a brutal place full of brutal men and many found it difficult to hold onto their values or far too easy simply to try and create new ones. With virtually no law or government comes opportunity to create what one will out of what one has, be it an edifice to horror or a utopian playland. Unfortunately it all too often begins as the latter and rapidly spirals into the former. Perhaps it was Barlow’s former tragedies that help him move through this landscape of insanity without losing too much of himself. He wears the scars of his past on his face in both a literal and figurative sense and perhaps the parts of him he had thought lost to those events were not so much gone as forgotten. His decisions are certainly informed by a core of, if not morality, then at least a well developed sense of right and wrong. Ethical certainty in the face of moral ambiguity can be difficult at best. Stripped of consequences, more than one person has found it difficult to distinguish the left-hand path from the right-hand path. Loathsome, Dark and Deep treads a path well worn by books that have come before, but it is a path of adventure and excitement nonetheless. Those looking for more gratuitously visceral fare under a horror label may be slightly disappointed, but if it’s a dark adventure with a strong protagonist you’re looking for, this novel delivers. Reminiscent of, if somewhat less graphic than, early Jack Ketchum (specifically Ketchum’s first novel, the Sawney Bean-inspired Off Season), Loathsome, Dark and Deep is a good piece of historical horror set against the backdrop of the forest, dark and deep.